Tis the season for gift giving. It is sometime hard to come up with one more thing for the Grandparents or family member seems to have everything. 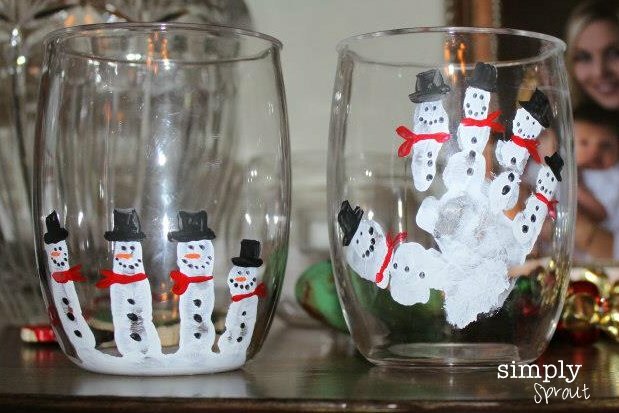 So give these a try, these simple snowman print glasses are the perfect conversation piece for holiday get togethers. Personalize them by adding some vinyl letters to the back. Grab some inexpensive bar glasses at Dollar tree or TJ Max. Using white acrylic paint dip your child's hand in, blot to remove excess paint before applying to the glass. align fingers along the bottom of the glass and press firmly. Allow to dry and then use some black, orange and red paint and a fine paintbrush to add some embellishments. These precious keepsakes will bring lots of JOY for years to come! You could even start the tradition of making one glass each year, watching how those snowmen grow year after year! Thanks Amy and little Miss Katie for the creative idea and beautiful glasses! Big changes in the New Year! Month of JOY: Christmas Card Giveaway! © 2015 Simply Sprout. Phoebe Template designed by Georgia Lou Studios All rights reserved.